Perception means everything in business. The way that people perceive you is how they believe you will operate as a provider. If people have a good perception about you, they will be willing to place their trust with in your hands. If people have a bad perception about you, they will choose another provider they feel better about. This is why it is very important to make a good impression when you are meeting new people. You never know what type of resources or capabilities the person you are coming into contact with has. Unfortunately, a lot of people in today’s world do not understand the importance of making a good impression. This is especially alarming when entrepreneurs fall under this category. As an entrepreneur, you should always aim for making a good first impression with people. You are a business owner — the face of your business. If you are perceived as unprofessional, you will never be able to grow your business because people would never want to become your customer. If you want to gain more customers, build a strong network of contacts, and build your personal brand,; you will need to break any bad habits that reflect negatively upon your character. 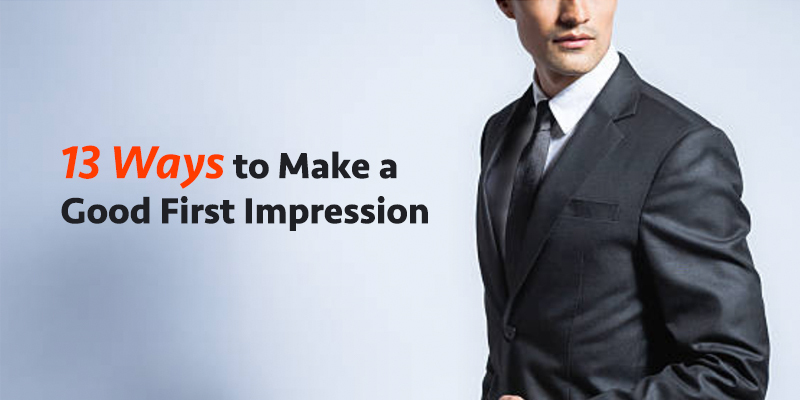 You need to make a first good impression because you are representing your business. It is not only about you anymore, you have a brand to represent. If you want to learn how you can definitely make a good impression on those you meet, continue to read for more information. When you are late for a meeting, it shows that you do not value the time of the person that you are meeting with. If you do not value their time, you will never value their business. When you hold people up, you are showing a lack of respect because they could have been doing other things instead of waiting for you. Even if the meeting does move forward, the person is annoyed because you have set their schedule back. If you feel like you will be late, call ahead of time instead of just showing up late without giving notice. People will appreciate your effort in keeping them informed, instead of having them wonder if you blew off the meeting. When you do not give notice it seems like your reason for why you are late is a fabricated excuse and an afterthought. Even if you have a legitimate reason, it would be seen as an excuse because you failed to make contact ahead of time. Dress like you belong in the company of the people you are meeting. If you are going to a corporate office, you should dress professionally. If you are meeting with a tech startup, you can get by with a t-shirt and jeans. You have to look the part so that people immediately see that you understand the culture they operate within. You can be the best candidate for the position or the best choice to be their service provider, but you negate your chances because you do not look the part. Also, take out time to make sure your grooming is presentable. We may live in a society that is more accepting than it once was, but business is still a professional environment. If you look sloppy and unkempt, you come across as someone who does not take care of themselves, which leads to the conclusion that you may not be responsible enough to get work done. Take pride in your appearance so that people will have respect for you. You cannot walk into a meeting and look sad or like you would rather be somewhere else. If you do not have a happy demeanor, people will assume that you have an issue with them – even if that is not the case. This throws the entire mood off and the meeting will go downhill from there. Now you have missed out on a good opportunity because your mood made the other person disengage from the meeting. Before heading into a meeting, get yourself pumped and ready to have a great conversation. Think about your desired outcome for the meeting, and how you plan to create a winning situation. When you visualize success your mood is more upbeat and friendly. This helps you win people over, which is a win for you. Show people that you are excited about meeting them by smiling when meeting them. A smile reflects that you are a happy person who is easy to work with. Smiling puts people at ease, which is exactly what you need if you want their business. Make sure your smile is authentic. People can see when you are putting on an act, which makes them believe that you are a dishonest person. You cannot come across as such if you want to have any chance at having a successful meeting. This is why you need to get yourself in a good mood so that your smile is much more natural. Making eye contact with a person shows that you are interested in what they have to say. It also shows that you have nothing to hide. When you try to avoid eye contact, it means that you do not want the person to see that you are lying about what you are saying. Eye contact also shows confidence. You believe in yourself and want people to recognize your value. Just do not make the mistake of staring people in their eyes constantly. It gives off the impression that you are trying to intimidate the other person, which creates the impression that you may be a difficult person to work with. When breaking eye contact, look away to make it seem like you are reflecting on the conversation. This helps you not stare into the person’s eyes the entire time. Your handshake is a reflection of how confident you are as person. An overpowering handshake makes it seem like you are trying to prove your strength. A weak handshake makes it seem like you are a weak person who lacks confidence. You need to create a balance between the two — a firm handshake that reflects confidence, strength, and friendliness in equal degrees. Having good posture is a reflection of confidence. If you are slouching, you come across as weak and as somebody who can just be pushed around. People do not want to work with someone who cannot hold their own. You need to stand tall, meet people with your eyes, have a great smile, and a firm handshake. You need to come across as being open to the conversation that is taking place. This means that your arms should not be crossed, and your hands should not be in your pocket or behind your back. Crossed arms means that you do not want to be there and are not interested in the conversation. You are unintentionally throwing the meeting off by doing these things. When meeting someone in their office, you should not walk in front of them and direct them to where you want to go. This is rude and shows that you want to be in total control, which means that you would be unbearable to work with. Let people lead you to where they want you to go when you are in their office space. Even if the meeting is about them becoming your customer, you still should show them respect, instead of trying to demonstrate your superiority. When you lean forward, you are showing the other person that you are listening to what they are saying. This helps them feel better about the conversation because their needs and concerns are being communicated and received. This makes them feel as if you can provide them with a great solution to their problem because you listened to the cause of their problems and what they want to accomplish. Pointing your feet at the other person shows that you are happy to be in their company. When your feet are pointed outward, it shows that you are trying to escape the conversation. These are subtle things that people may notice and analyze when they are talking to you. You want to mirror the body language and facial expressions of the person you are talking to. Doing so makes them feel as if the both of you have good synergy, which means that the working relationship would be great. If the person smiles, you need to smile. If the person talks with their hands, you need to do the same. This is the most important factor of them all. Give the person you are meeting your full, undivided attention. You want them to know and feel that what they are saying matters to you and that you have fully received and understood their concerns. Focusing on the person is a lost art that many people do not have in today’s world due to distractions such as phones. Train yourself to be conscious of the behavioral tips outlined above whenever you meet someone new. In no time, you will find these habits becoming second nature as you make a good impression on almost everyone you meet. We are excited to help your business get the most out from our services. Looking for Singapore Company Formation, Tax and Accounting or any corporate services. Simply fill out the form and we will be glad to assit you.